Throughout the Palmer Long Term Ecological Research cruise, we’ve seen several different groups of seabirds. 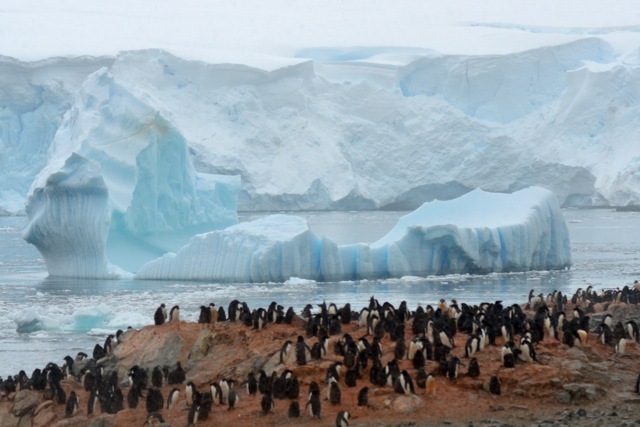 Nothing compares, however, to Avian Island, home to approximately 200,000 Adélie penguins. Located at 67°46′S 68°54′W along the Western Antarctic Peninsula, Avian Island is home to several colonies of seabirds, including skuas, giant petrels and gulls with Adélie penguin colonies taking up most of the space. As part of the Palmer LTER project, researchers conduct regular surveys of Avian Island, monitoring colony size and breeding success for changes in the populations. While most Adélie colonies are decreasing in size further North along the peninsula, Avian Island is growing with approximately 75,000 breeding pairs taking up residence on this small rocky island. Due to its importance for the Adélie population, as well as other seabirds, Avian Island is a protected area and access is allowed for special research by permit only. 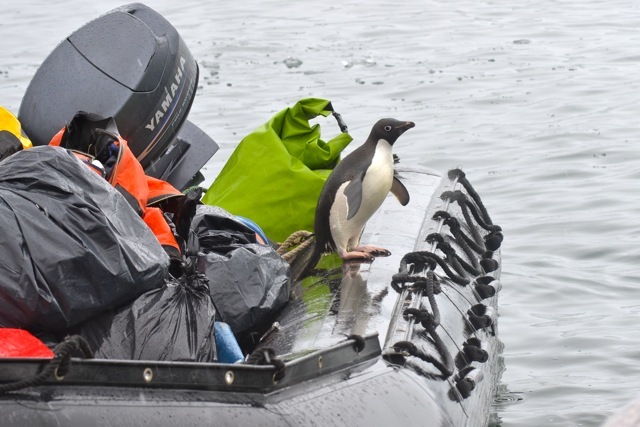 The R/V Laurence M. Gould dropped off two researchers for several days to allow them to do their surveys. Now it was time to pick up the researchers at their field camp. On a snowy day, a small group hopped into the Zodiac to go and retrieve the crew. Once we landed and made our way over slippery rocks, we headed toward the field camp to pack up tents and gear and then haul it back to the beach. Upon our return to the Zodiac, we found a small passenger ready to go. Fortunately, it decided to hop into the water but only after we took several pictures! 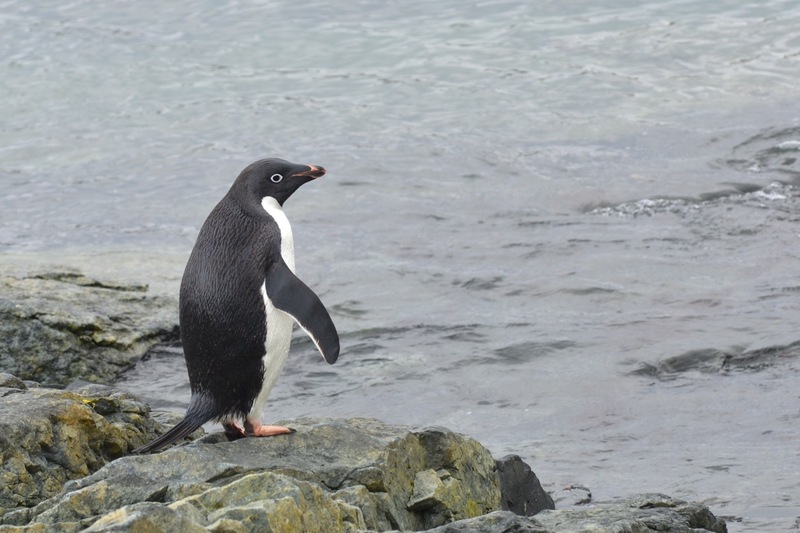 Though many other colonies further north are declining due to climate change and decreasing sea ice, the Adélie penguin population on Avian Island, which is further south along the peninsula, is actually growing. Adélie populations will face a challenging future. Temperatures have risen significantly due to climate change along the Western Antarctic Peninsula (WAP), much faster than the global average. 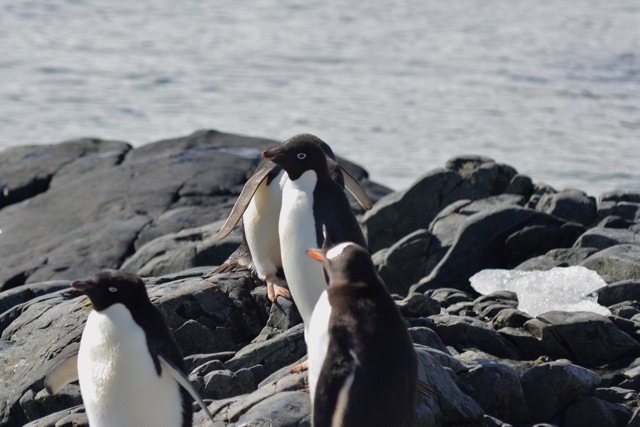 Adélie colonies have started to see the introduction of sub-Antarctic penguin species, such as the gentoo and chinstrap penguins, which can withstand warmer temperatures. Habitat space will become limited, making it more difficult for Adélies to find appropriate nesting space to raise their young. Another challenge from the rising temperatures is the decrease in sea ice and changing weather patterns, both causing alterations in the food web in the area. Adélies will have to compete for these changing resources with other animals, putting pressure on already challenged colonies. 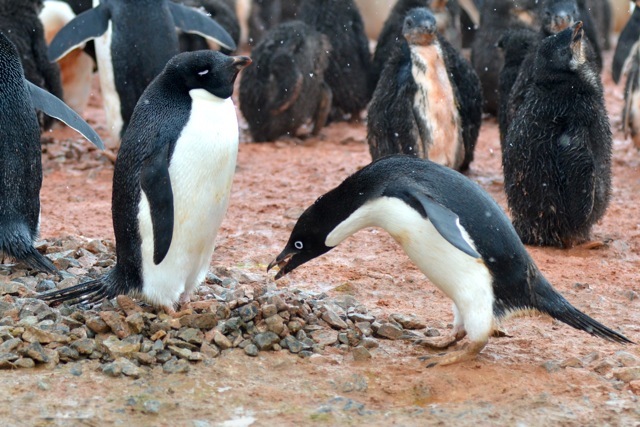 It is difficult to predict the full extent of these changes, but Palmer LTER researchers are working hard, putting the puzzle together to see what the future holds for the Adélie penguin. All of Jo's entries are cross posted on the Palmer Long Term Ecological Research Station site here. Track her progress on the R/V Gould, and learn more about the Palmer Long Term Ecological Research Station. Meet some researchers and explore the station with our archived Google+ Hangout with Palmer! I hope you are having an amazing trip! 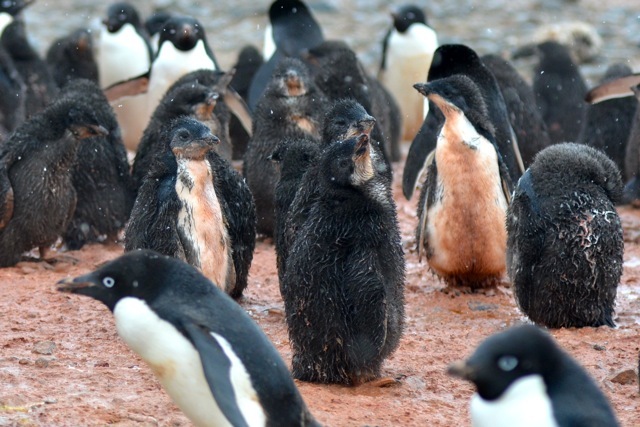 I wonder if the Adelie chicks are taller than the chicks on Torgersen Island because they are two weeks older?